It’s another busy day in the ED when an elderly female comes in from triage with fever, cough, and new oxygen requirement. Even before the patient comes back you are concerned for pneumonia with sepsis. The patient is tachycardic and hypotensive with a shock index greater than one. You institute early antibiotics and fluids and systematically begin to aggressively resuscitate her. The patient requires nearly four liters of normal saline before her blood pressure stabilizes. Your attending suggests that your liberal use of normal saline will induce a hyperchloremic metabolic acidosis, and perhaps you should have used lower chloride containing fluid, like lactated ringers. You perform a brief literature review on the topic of balanced resuscitation using lower chloride containing fluids. Take home points: Administration of large volume of isotonic saline is associated with a metabolic acidosis. Animal models have demonstrated decreased renal perfusion with chloride containing fluids. Several retrospective studies indicate that chloride is an independent risk factor for mortality in acutely ill patients. More and more literature in humans seems to indicate that a ‘balanced resuscitation’ may decrease morbidity, and possibly mortality, in patients receiving large volumes of crystalloids as part of their resuscitation. A single nonrandomized study demonstrated a correlation between low chloride fluids and decreased use of renal replacement therapy. Blinded, randomized, prospective studies are needed to further elucidate this observed effect. Dr. Schwarz, an Assistant Professor here at Wash U, and both an Emergency Physician and Toxicologist has provided some of his own thoughts on the topic. First, I’d like to thank Louis for picking a great topic and generating discussion about a very important subject. I initially became interested in this topic a few years ago. Originally, I was much more interested in the mechanism by which normal saline (NS) caused a non-anion gap metabolic acidosis, and that’s when I learned about the strong ion difference and a ‘balanced resuscitation.’ As a full disclosure while I found the pathophysiology really interesting, I initially didn’t think it had much clinical relevance. However as more investigators have studied this, I’ve come to believe that my initial impressions were incorrect and changed my practice. The last time I reviewed the literature, I didn’t see a randomized, controlled trial comparing resuscitation with NS and lactated ringers in the ED. However I do believe that there are studies out there that are applicable to the ED. A retrospective study compared patients undergoing elective or emergent general surgery that received either NS or a ‘balanced fluid.’1 Unadjusted mortality and the number of patients developing major complications were higher in the group that received NS; after adjusting with propensity scoring, the mortality was no longer significantly different between the 2 groups. However, patients that received NS were 4.8 times more likely to require dialysis. In a meta-analysis of patients with sepsis, patients that received a ‘balanced resuscitation’ had a lower mortality than patients receiving NS.2 The trend, however, was not significant. In a promise to keep this short, I won’t review all the other literature that has been published on this topic and kept the discussion on the 2 articles that I did include short. I’ll also concede that the literature is not perfect, and as I mentioned earlier, I’m also still waiting for that perfect ED-based study to be completed. However the cost of NS or a ‘balanced solution’ such as lactated ringers is nearly equivalent. I’m also not aware of significant complications from administering lactated ringers in most patients. So when the risks, costs, and benefits of implementing a ‘balanced resuscitation’ verses a standard resuscitation with NS are viewed together, I think there is enough evidence to consider changing your resuscitation strategy. Kishen R, Honoré PM, Jacobs R, et al. Facing acid–base disorders in the third millennium – the Stewart approach revisited. International Journal of Nephrology and Renovascular Disease. 2014;7:209-217. doi:10.2147/IJNRD.S62126. Shaw A et al. Association between intravenous chloride load during resuscitation and in-hospital mortality among patients with SIRS. Intensive Care Medicine. 2014;40(12):1897-1905. doi:10.1007/s00134-014-3505-3. Waikar SS, Saving the Kidneys by Sparing Intravenous Chloride?.JAMA. 2012;308(15):1583-1585. doi:10.1001/jama.2012.14076. Yunos N et al. Association between a chloride-liberal vs chloride restrictive intravenous fluid administration strategy and kidney injury in critically ill adults. JAMA 2012; 308: 1566– 72. 1. Shaw et al. Major Complications, Mortality, and Resource Utilization after Open Abdominal Surgery: 0.9% saline compared to Plasma-Lyte. Ann Surg 2012;255:821-829. 2. Rochwerg et al. Fluid Resuscitation in Sepsis. A Systematic Review and Network Meta Analysis. Ann Intern Med 2014;161:347-355. An infant female with no significant history presents to your trauma bay after reported accidental blunt trauma to the abdomen, the patient arrives from a referral hospital where plain films demonstrated free air. On arrival the patient show signs of hemodynamic instability and an elevated lactate. The patient was decompressed with "needle peritoneumostomy" prior to going to the OR for exploration. Can “tension pneumoperitoneum” cause hemodynamic instability? Signs and symptoms of TPP include abdominal distension and fullness. The additional presence of a tympanitic, rigid abdomen, hypotension, dyspnea, and jugular vein congestion can be considered as signs of TPP, requiring immediate management. The diagnosis of tension pneumoperitneum should be based physical exam and supported by imaging of the abdomen. Plain films of the abdomen show large amounts of intraperitoneal air. Lateral supine and left lateral decubitus films show the air best. Elevation of the diaphragm or medial displacement of the liver, called the “saddlebag sign” is suggestive of tension physiology. The viscera may appear more distinct as they are outlined by the air tissue interface as in the double-wall sign (the visualization of the outer wall of bowel loops caused by the presence of extraluminal and intraluminal gas). Another radiographic sign of a large pneumoperitoneum is football sign - the intraperitoneal air outlines the abdominal cavity and the falciform ligament appears like the laces of a football. -Pathophysiology and treatment is similarly to pneumothorax, it can lead to cardiovascular collapse, respiratory failure, and eventually death if untreated. Unstable patients should be recognized on exam, however x-ray and CT have utility based on stability. Decompression is the treatment and can be performed with an angiocath placed two centimeters below the umbilicus in the midline. Lin B, Tension Pneumoperitoneum. The Journal of Emergency Medicine, Vol. 38, No. 1, pp. 57–59, 2010. Khan ZA. Conservative management of tension pneumoperitoneum. Ann R Coll Surg Engl. 2002 May;84(3):164-5. Ogle JW Tension Pneumoperitoneum after Blunt Trauma. The Journal of Trauma: Injury, Infection, and Critical Care. 1996 Nove; 41(5): 909-911. Falkenburg C. Ein Fall von Gasansammlung in der freien Bauch-Hohle. Dtsch Z Chir 1913;124: 130-6. Olinde A, Carpenter D, Maher J. Tension pneumo-peritoneum. Arch Surg 1983;118:1347-50. Ferrera PC, Chan L. Tension pneumoperitoneum caused by blunt trauma. Am J Emerg Med. 1999 Jul;17(4):351-3. Yakobi-Shvili R, Cheng D. Tension pneumoperitoneum--a complication of colonoscopy: recognition and treatment in the emergency department. J Emerg Med. 2002 May;22(4):419-20. Fu K, Ishikawa T, Yamamoto T, Kaji Y. Paracentesis for successful treatment of tension pneumoperitoneum related to endoscopic submucosal dissection. Endoscopy. 2009;41 Suppl 2:E245. Williams DT, Manoochehri P, Kim HT. Tension pneumoperitoneum. Emerg Med J. 2014 Nov;31(11):943. Mills SA, Paulson D, Scott SM, Sethi G. Tension pneumoperitoneum and gastric rupture following cardiopulmonary resuscitation. Ann Emerg Med. 1983 Feb;12(2):94-5. It seems that predicting volume responsiveness is the never-ending tale in critical care medicine, as numerous methods have been proposed over the past several years with varying degrees of success. With the expansion of ultrasound, measuring IVC collapsibility has been one of the more popular methods utilized in the emergency department. However, measuring the IVC can often be limited by body habitus, excessive intra-abdominal gas, respiratory variation, and operator experience. (1) Measuring IVC collapsibility at greater than 50% has been shown to correlate with a CVP of less than 8mmhg, and a lower CVP has been associated with volume responsiveness, but a higher CVP does not exclude volume responsiveness. (1) A recent paper by Marik et al described the novel use of Carotid VTI and passive leg raise (PLR) as a marker of volume responsiveness in hemodynamically unstable patients. The benefit of PLR is that it produces a hemodynamic response similar to a 200-300ml bolus, is relatively easy to perform, and is rapidly reversible. Studies have shown that only 50% of hemodynamically unstable patients are volume responders. Appropriate fluid resuscitation in sepsis is associated with improved outcomes, while excessive fluid administration is associated with increased ICU LOS and mortality. Determining fluid responsiveness is difficult but VTI combined with PLR appears to have both a high specificity and sensitivity for predicting volume responsiveness. More studies will be needed to demonstrate validity of this method. 1)Nagdev A et al . Emergency department bedside ultrasonographic measurement of the caval index for noninvasive determination of low central venous pressure. Ann Emerg Med. 2010 Mar;55(3):290-5. doi: 10.1016/j.annemergmed.2009.04.021. Epub 2009 Jun 25. 2) Marik P et al. The use of bioreactance and carotid Doppler to determine volume responsiveness and blood flow redistribution following passive leg raising in hemodynamically unstable patients. You are working in Trauma Critical Care when a middle aged male with end-stage liver disease presents with altered mental status. He is hypotensive and tachycardic. You resuscitate him with IV fluids, start broad spectrum antibiotics and initiate vasopressors. You confirm a source of infection with a paracentesis. Despite multiple and escalating doses of pressors, the patient's blood pressure continues to fall. You perform a RUSH exam, run through your differential diagnosis again, and confirm that all lines and tubes are connected appropriately. As you prepare his family for the worst and sign him out to the ICU, your colleague suggests - what about methylene blue? Is it worth a shot? Is there a role of methylene blue in management of septic shock? Methylene blue was initially developed as a dye for the textile industry, then used as a stain for TB, treatment for malaria, treatment of cyanide toxicity, and more recently methemoglobinemia. Typical dosing for methemoglobinemia is 1-2mg/kg of 1% solution IV. In a recent review performed by the Toxicology Department at UCSD published in the Journal of Emergency Medicine in 2013, the authors presented the evidence behind the utility of methylene blue in the septic patient . Methylene blue (MB) is useful in septic shock due to its ability to increase peripheral vascular resistance and its reversal of myocardial depression. Its mechanism of action is thought to be due to inhibition of inducible nitric oxide synthase (up regulated by endotoxin and cytokines producing vasodilatory nitric oxide and guanylate cyclase (makes vasodilatory cGMP) [2,3]. There have only been two randomized controlled trials that studied MB in septic shock (n=20; n=30). In these studies MB was found to increased mean arterial pressure (MAP) and decrease vasopressor requirements, but there was no statistically significant difference in survival rates. Other studies reviewed for this publication were case series and case reports. In these, varying doses of MB were used ranging from 1-3mg/kg over 10-20 minutes, which all increased MAP, systemic vascular resistance (SVR), and mean pulmonary arterial pressure. However MAP and SVR returned to baseline 2-4 hours after MB administrations. With doses greater than 4mg/kg or rapid or prolonged (greater than 6-10 hrs) infusion, potential side effects of MB use includes serotonin syndrome reaction (if already taking serotoninergic agents, MB inhibits monoamine oxidase), methemoglobinemia (if G6PD deficiency, or at high doses MB acts as oxidizer instead of reducer), platelet aggregation/reduction, and vasoconstrictive effects with possible decreases in splanchnic perfusion and arterial oxygenation (do not use in ARDS or pulmonary hypertension) [1,3,4]. The clinical effects of MB persist for 2-3 hours (half-life=102 minutes) and should be preferably administered centrally as peripheral administration can cause cutaneous necrosis [3,4]. 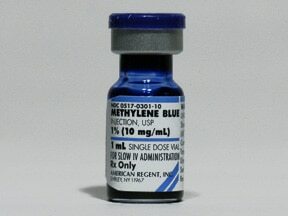 -Methylene blue may prove a useful adjunct to vasopressors in cardiovascular collapse. -Remember additional shock management strategies include adequate volume resuscitation and source control, inotropy, respiratory support, correction of electrolytes (K, Ca, Mg, Phos) and glucose, consideration of endocrine dysfunction (thyroid, adrenal, vasopressin), and ruling out obstructive etiologies. 1. Lo JC, Darracq MA, Clark RF. A review of methylene blue treatment for cardiovascular collapse. J Emerg Med. 2014 May;46(5):670-9. 2. Landry DW, Oliver JA. The pathogenesis of vasodilatory shock. N Engl J Med 2001; 345(8): 588-595. 3. Kirov MY, Evgenov OV, Evgenov NV, Egorina EM, Sovershaev MA, Sveinbjørnsson B, Nedashkovsky EV, Bjertnaes LJ. Infusion of methylene blue in human septic shock: a pilot, randomized, controlled study. Crit Care Med 2001; 29(10): 1860-1867. 4. Juffermans NP, Vervloet MG, Daemen-Gubbels CR, Binnekade JM, de Jong M, Groeneveld AB.. A dose-finding study of methylene blue to inhibit nitric oxide actions in the hemodynamics of human septic shock. Nitric Oxide 2010; 22(4): 275-280.